– What was your first experience with motorbikes that got you into it? Pep: One of my friends took me for a ride on his large cc scooter in Paris. High speed, on the motorway. I literally had to hold on to my pants. When he asked me, before the ride, if it was OK that we take the scooter, I thought he meant one of those “pushscooters”. Lev: I was about 13-14 years old, when my brother asked my family to come to the backyard to have a look at his new purchase. 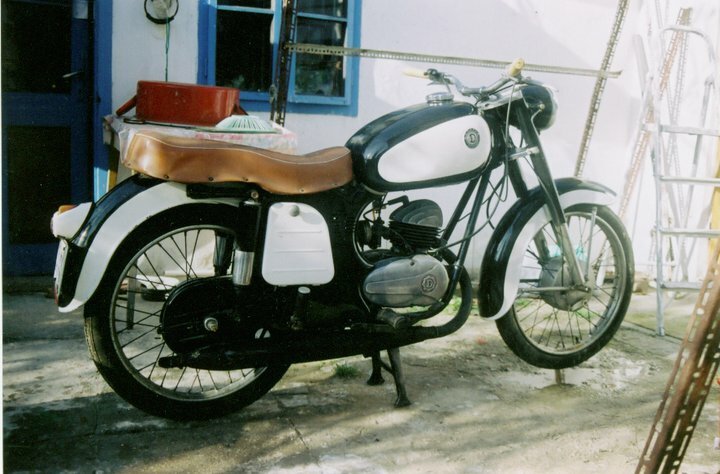 It was a dusty old classic bike: a black Danuvia 125. That moment, for me, was stunning. It brought up a memory I had long forgotten, from times when I was so small that I didn’t even try to reach for door handles, or get in a bathtub alone. That time we had a moped, a huge and beautiful wonder of the garage. It was my father’s, and out of order for years. The shape of it was so extreme and complicated that I had no chance climbing on it. I just span the front wheel that was slightly off-ground, redirected the headlight that was out of order too, moved the metal arms that are near to the part I knew I should place my feet on. I could do this for hours. When my brother came to the garage and saw me playing there, he put me on the moped. We “rode” it together sometimes, but he also often let me do it alone: I was making the noise of the engine out loud with my mouth, and steering the handlebar. With one hand, because my arms were too short to grab both ends while turning. I also imitated bumpy roads, moving it like a clumsy rocking horse. – What motivates you in riding? Pep: Freedom at the most. The aesthetics of the mechanical complexity.And of course, a drop of adrenalin and nice curves. Yes, Nice Curves ! – What motivates you to learn mechanics? Pep: Bikes appear in my mind as living organisms, so it is daring and challenging to heal them or make them better. I’m also into electric vehicles. Lev: Putting old, or simply half-dead bikes and parts together, and make them work again. It can be quite emotional. – What was the most difficult mechanic fix you did on a bike so far? Pep: Filling gas, haha. Ok, let’s say something like adjusting a carburator or replacing an igniter. Lev: Starting my Kymco with dead choke is almost like a daily mechanic fix. I have replaced brake shoes in drum brakes, I think that was the most difficult so far. – Self-built dream custom bike? Pep: Kaneda’s bike from AKIRA with a little more Italian feel to it. A ducati 749 turned into a tourer. Or a BMW gs1200 ‘ratified’. Lev: A scrambler, using up mostly low budget but quality used parts, except the ones that are crucial for safety and comfort, like suspension, and forks: those would be high-end, no matter what. – Spaghetti, sushi or steak? Pep: Sushi but only when it comes to eating. Damn I prefer Italian bikes even if they fall apart. Like we all do, sooner or later. Lev: Half steak – half sushi. – What is your favourite part of the motorbike? Pep: Its heart, the engine of course. But I appreciate those things like handlebar, wheels or chain. You wouldn’t get far without them. That’s the beauty of it. Lev: I would say the engine in general, but it depends. On a Honda Pacific Coast it’s the body, on a TW 125 it’s the combination of the rear wheel, saddle and fuel tank. The Danuvia two years later. Due to the momentum of excessive enthusiasm we painted it stylish black and white instead of authentic black.